I got this back yesterday afternoon in the mail. It’s the first of the new through the mail cards I recently sent out. This is one that is business card size. I really wanted Elroy Face’s autograph because he’s a Pirate fan favorite. He fits under my Hall of Fame or All Star Collection. He had a 17 year career the spanned 1953 – 1969. He was a three time All Star from 1959-1961. The most important part of his career is that he became the first of what would become the modern day closer. He was the first peron to save 20 or more games three times in his career. He would end up saving a MLB best (at the time) 193 games. His pinnacle came in 1959 where he would win his first 17 straight games in relief and go 18-1 with 10 saves. He is currently 47th overall in career saves. He never made it to the Hall of Fame, which personally I think he has been slighted. Was he as good as Sutter / Ekersley / Rivera? No probably not, but he paved the way for players like them to become superstars. I almost see him as an innovator. It’s been at least a week since my last update to the blog, but I wanted to have some substance to talk about. Also work has been a bear and it’s been tough to get some time to myself to do much of anything. Let’s get down to business. What the heck have I done since my last post? First off I decided to play around with a design for my mini cut autograph custom card set. If you look to the right you can see my interpretation of the 1953 Topps Baseball card. 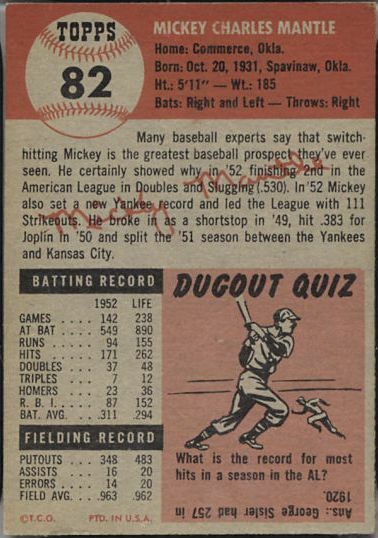 For reference, below are examples of the front and back of the 1953 set. When I imagined the the custom cut card I needed to rotate the original so that it was on it’s side and envision what the Topps designers would do to make a cut auto card. I kept the red band along the bottom with a yellowed vintage look to the border. I wanted to keep the name white, position black and the team name yellow. I was going to keep the logo on the left side, but it would make for an awkward signing location for the athlete. Now flip it to the back. I kept the large baseball and large band of red on top. The rest of the card I made light brown to simulate cardboard. After adding the name, I had a lot of room in the red band. Add that and the fact that I couldn’t squeeze in “one of one” and “authentic autograph” on the front of the card, it looked nice to place it on the back in yellow so it matches the front. Then I added the usual text and Topps created picture and viola, it’s done! Cory Snyder – one of my all time favorite players from the 80s. Followed him from college, to the 1984 US Olympic team to his epic first year in the pros. I think I still have a lot of 50 of his team USA rookie cards. Elroy Face – Will always love his 1959 season. Going 18-1 with 10 saves. Also his first of three back to back to back All Star appearance. Ron Gant – Great all around player. From both an offensive and defensive perspective. Very underrated and a two time All Star. Definitely looking forward to getting this one back. Roy Sievers – Rookie of the Year and four time All Star. Plus a fan favorite for years. These all went out during the week, so hopefully they come back in about two weeks. 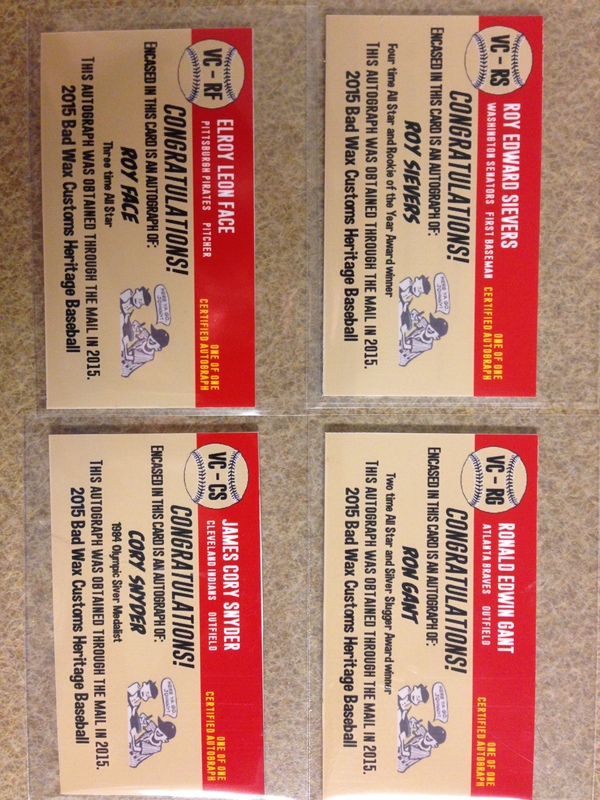 Now for the TTM success I had. OK so maybe it wasn’t a true TTM. This card on the right was sent out to Isias at cash4graphs for his Gaylord Perry signing. 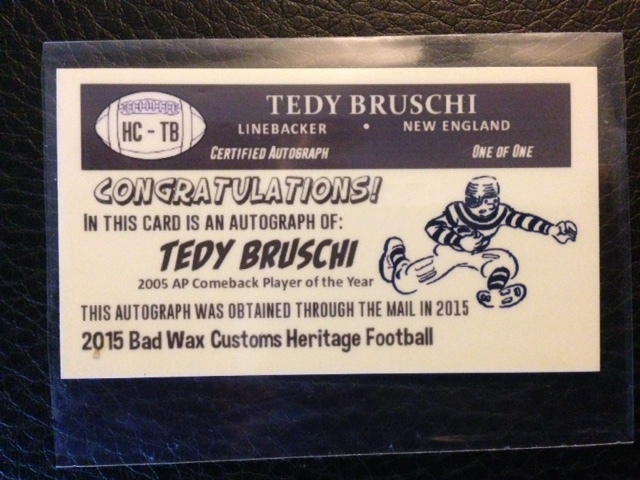 For just 10 bucks I got a custom card of mine signed by a Hall of Fame player. I love how it came out. The turn around time was excellent. I have to say overall I would buy from him again. His upcoming signings include the likes of Hank Aaron among others. So he is legit and he will also provide proof of signing if needed so thats a win in itself. Let me know what your opinion is on the new mini design. Oh and as for tomorrow, go Seahawks! I wanted to get back into through the mail autograph collecting again. It’s been a while since I last sent out cards. The last batch I sent out was for soccer to MLS stars. I have to admit, those guys are the nicest respondents I have ever gotten back. Some even included letters of there own back to me. What I’d like to do though is to create mini cut autograph cards with the huge batch of old business cards I have. 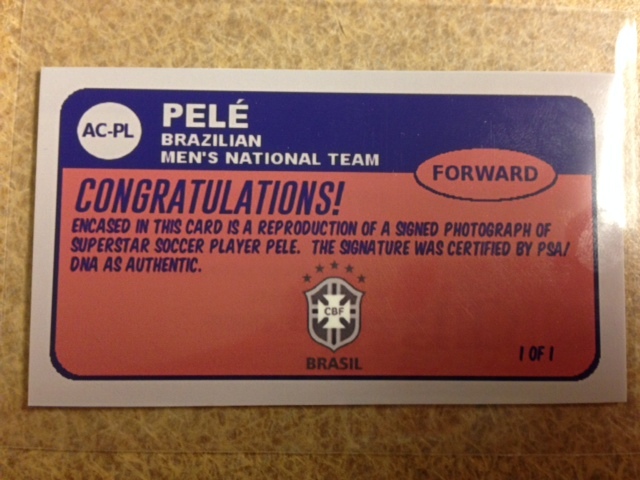 I tried this once before making a Pele replica cut autograph seen to the right. I really do love how that came out. 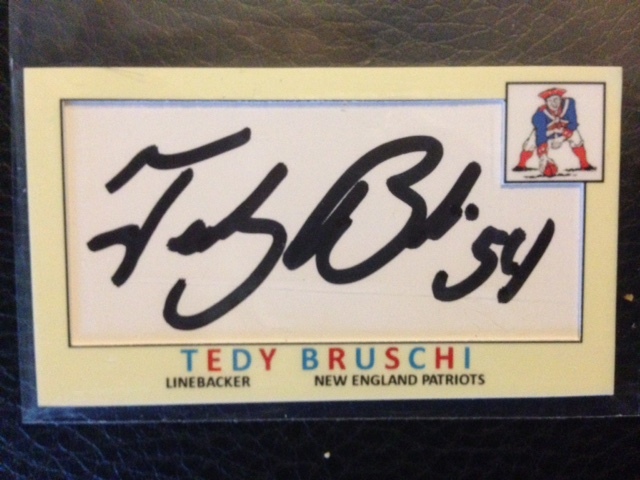 There are some obvious problems with making a mini cut autograph. First off, the window is tiny. Accounting for a sizable border so that the card can be trimmed, I had to make the window small. Next toss in the fact that I need some room to design something and the window gets smaller. So in order to do a TTM card to send out, I would have to send them the made card to do the signing in the window and that kind of defeats the purpose of a “Cut” autograph. The other option would be to forgo a fancy “retro” design on the front in order to have the biggest available window, which is probably going to be the way I end up going anyways. The idea was to send out the blank business card to get the autograph, then turn it into a card when I had time. However how many TTMs will come back with a signed business card? I don’t think many would. So I guess either way I’m going to have to come up with a plan. I will say this though. the back of the card came out looking quite nice and stayed very much true to the original version of Topps 1985 football. I think I’ll make a few versions of these before I start sending them out. I may have to go the route of the Sport Kings cut auto and make a borderless card to make it easier for the athlete to sign. I’m thinking to start, one football, one baseball and one hockey. I’ve been toying with the 1948 Leaf Boxing, 1979 Topps Football, 1977 Topps baseball, and 1977 Topps Hockey designs. So starting tonight and working into the next few weeks I will roll them out as I finish them. Also check back later this week for my second installment on how to make a custom card. Finally, I want to send a thank you out to anyone who reads this blog and as a token of my appreciation I will have a giveaway as soon as we reach 1000 views. So stay tuned . . .